US demand for food and beverage natural colors will grow to nearly $300 million in 2021. 4.7% per year through 2021. Red and yellow natural food colors will remain the largest color segments among food and beverage natural colors and will account for the largest share of new demand. The US has a relatively low rate of conversion from artificial to natural colors compared to other developed economies, where regulatory environments favored the switch to natural colors. 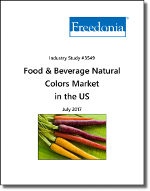 This Freedonia industry study analyzes the $204 million US food and beverage natural colors industry. It presents historical demand data (2006, 2011, and 2016) and forecasts (2021) by color class, including red, orange, yellow, green, blue, purple, brown, and other. The study also evaluates company market share and offers strategic analysis on industry competitors including Chr. Hansen, Sensient, GNT, and Naturex.